In view of the present struggle in the far east it is perhaps of general interest at this time to consider the possible results. This war is one which involves not only the interests of Japan and Russia, but its ultimate outcome is certain to affect the material and moral welfare of the entire world. The far-Eastern question, like that of the near East, is made up of a group of problems which cannot be solved by isolation. Who can forecast the destiny of Russia? With a total war-footing of almost three million in troops, an irresponsible monarch, a discontented populace, and the doctrine of hereditary aggression as the ruling motive of imperial action, can we hope for peace? That liberty in the full sense of that debatable term should come to Russia this year or next is impossible, for her people have not yet reached that stage of advancement to be capable of governing themselves. Russia has been stamped not only as the most despotic, but most barbarous of civilized nations. On the other hand the rise and growth of the Japanese empire to the stature of a world power is the marvel of the twentieth century. (In Japan we see the rising of a new sun but can only dream of what it will be when it reaches its glorious meridian.) The chief characteristics of the Japanese people are summed up in the assertion that they are honest, ingenious, courteous, frugal, animated by a strong love of knowledge and faculty of imitation, and possessing a sentiment of personal honor exceeding that of any other nation. It is but just to say that victory should come to the people whose achievements along the line of progress have been such as to surprise civilization. For Japan the war is a national necessity, she must expand or die. Russia’s traditional friendship with this country is very much ridiculed by many of our newspapers, her civilization and government are condemned, and her trade policy in the far East is criticized as a menace to our commerce there. Our papers recall with pride the fact that it was an American Commodore Perry, who in 1804, opened Japan to civilization, and they now look upon Japanese ascendancy as the hope of Asia. Japan is not only fighting the battle of progress and civilization in placing herself in opposition to Russian advance in Asia, but she is standing as the champion of commercial rights in whose main tenance no nation is so vitally interested as the United States. With Japan paramount it is the belief of the observing class that American trade and influence in Asia would enjoy a rapid growth; while with Russia paramount it is believed that our merchants would find the door closed against them. Russia may be grasping and aggressive: she can afford to leave the whole of Korea to little cramped up Japan. But this does not warrant the assumption that she represents reaction while Japan is the champion of liberalism and progress in the present contest. 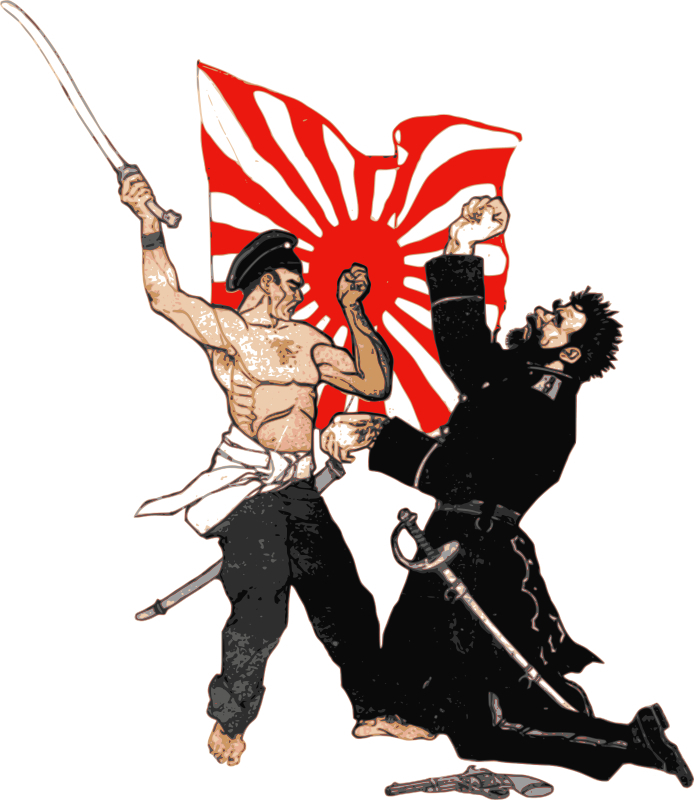 The great purpose of Japan has not been to win victories so much as to impress upon the Russian government the absolute futility of Russia maintaining in the far-East such an empire as would menace the national existence of Japan. When we think that the main point of the Japanese demand was that of carrying out the Russian pledge to the Peking Powers,to maintain the administrative entity and territorial integrity of the Chinese Empire — a Mckinley-Hay policy which Russia had bound herself to keep by a sacred pledge alike to the United States and other Peking treaty signers as Japan. American sympathy must be with a nation that has made this common grievance, and peculiarly American grievance, all her own, and inasmuch as the battle of the Japanese nation is to punish Russia for the shameless perfidy in sight of the world in Manchuria, and to enforce the Russian promise of the open door for all the world in China, the Japanese nation’s battle is ours. Manchuria and Korea treaties and the rights of settlement are but the flying flags of the skirmish line by the side of the great issue which drove little Japan into the last of independent Asiatic lands to fight for the independence of the yellow race in Asia. In reality, China is sick, and only Japan can save her. If Russia wins the Asiatic sun will set to rise no more, and China like India, Japan like Turkey, will be subject to the European system and its oppression. If Japan wins China will be reorganized under Japanese influence and half of Asia, and a third of the human race will enjoy liberty and self-rule. Whether Japan be victorious or defeated in her great struggle with her mighty foe, the moral victory of the Japanese people seems already to be absolutely complete and it is impossible to overestimate the value of it. She pursues no egotistic purpose, but seeks the subjugation of evils hostile to civilization, peace and enlightenment and her victory might well result in a great advantage to the peace, prosperity and true religiousness of the entire world. Besides she has proved the reality of her own physical and spiritual ideals. Let us hope the sun of Japan is now rising and her far-famed victories are but the heralds of what is to be when it reaches its full glorious meridian. The heart of every American leaps with pride and reverence when he beholds the bright and glittering folds of the “Stars and Stripes;” but his patriotism is not mere hollow idolatry of national strength and grandeur but is genuine adoration and gratitude for the full measure of freedom and protection from the oppressors’ power. Fierce and long were the struggles for freedom from the rule of oppression, and because of these struggles our sympathies always go out to any nation struggling for its rights among nations, but victory always perches on the banner of right. He who neither slumbers nor sleeps, and who even marks the sparrow’s fall, holds also the destinies of nations in His hands. Let us hope that back of this fierce war-cloud the gentle beams of peace are even now ready to burst forth in rich splendor, shedding their magnificent rays of goodwill and brotherly love over both friend and foe, and dissolving the gloom of hatred and oppression. Delivered by Clyde Jenkins, Cable, Ohio.